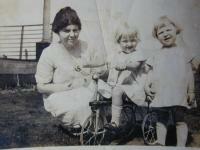 Arnott and Vederoff Ancestors - Alice Joyce (on bicycle) and Eudora with their mother, Beulah Ainsworth Stevens. Photo taken about 1922. Alice Joyce (on bicycle) and Eudora with their mother, Beulah Ainsworth Stevens. Photo taken about 1922.